Letter of recommendation from Hon. Minister of Communications to Wavet Letter of recommendation from Hon. Minister of Communications to Wavet — Wavetra Energy LTD.
Letter of recommendation from Hon. Minister of Communications to Wavetra Energy LTD.
We are glad to receive the letter of recommendation from the Honourable minister of Communications, Barr. Abdur-Raheem Adebayo Shittu, fncs. to the M.D/CEO Wavetra Energy LTD. 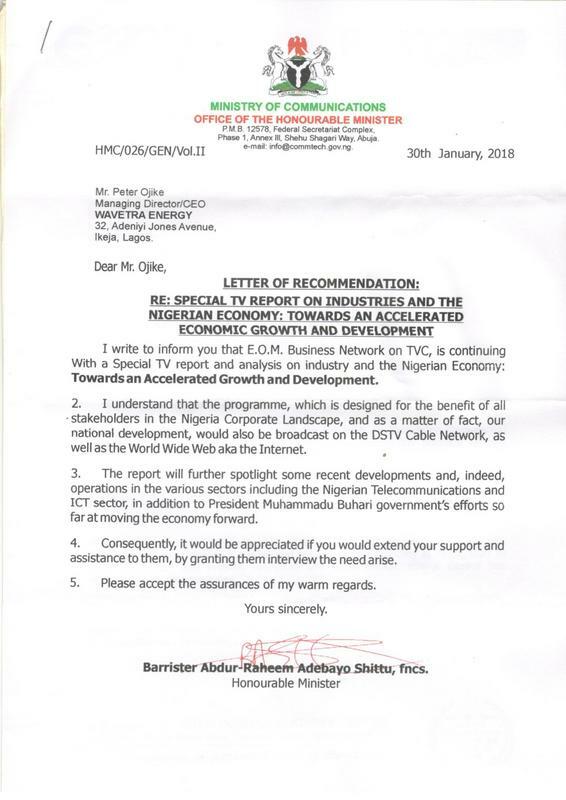 The letter titled: LETTER OF RECOMMENDATION: RE: SPECIAL TV REPORT ON INDUSTRIES AND THE NIGERIAN ECONOMY: TOWARDS AN ACCELERATED ECONOMIC GROWTH AND DEVELOPMENT, appealed to the Managing Director of Wavetra Energy LTD. to kindly grant E.O.M Business Network an interview and in our own case, an interview on the progress report of Renewable Energy in Nigeria. The letter went on to state that the interview will be aired on DSTV Cable network and live on the internet. Please find the letter below: We are deeply thankful to the Honorable minister of Communications and also to E.O.M Business network for following our activities in the renewable energy space of Nigeria and for recognizing what we do at Wavetra Energy LTD even without us approaching them first. We are also thankful to all our team at Wavetra Energy LTD. for the hard work and effort put in so far to serve our customers and in propagating the good news of clean and solar energy. Thank you all! Peter Ojike. MD.